For many years I have relied on a home-made flash bracket for photographing frogs and toads and butterflies. This bracket was constructed from aluminum strapping purchased at a local hardware store. The design was quite simple and the bracket was easily made. In fact, I simply followed John Shaw’s instructions on how to make such a bracket in “The Nature Photographer’s Complete Guide to Professional Field Techniques” that was first published in 1984. This home-made bracket has served me well over the years and certainly allowed me to capture many of my most cherished frog images, however, this bracket also had its share of issues. I often found it awkward to carry in the field as it would not store easily in my gear bag, the weight of the flash would cause the bracket to sway, and I disliked having to hold it during long hikes. Enter the Wimberley Macro Flash Bracket – Single-Arm Set-up, which is by far the best design and the most user friendly macro flash bracket on the market today. A couple of months ago Wimberley was kind enough to supply me with a Macro Flash Bracket – Single-Arm Set-up for my frog and toad photography this season. I have given this flash bracket a thorough workout and can honestly not find a single issue with it or its design. One of the things I like best about this bracket is that it will fold down to a small enough size that I can fit it into my back pocket or a jacket pocket for carrying convenience, I can position the flash in any direction I wish thanks to the multi-jointed design, and once the locking knobs are tightened the bracket is rock solid. What I like most of all about this flash bracket is the multi-jointed design that literally allows you to position the flash in any position desired to obtain optimal light on the subject. 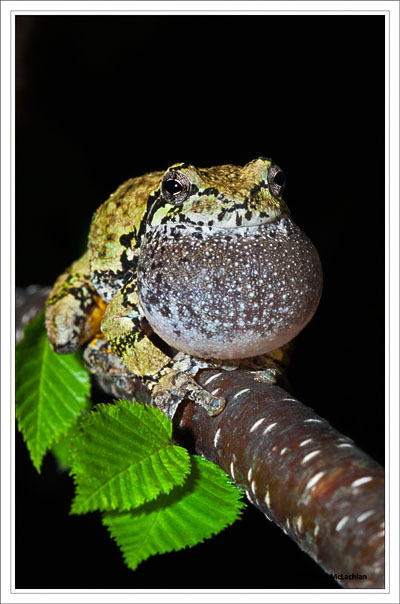 I find it particularly useful for capturing Gray’s Treefrogs chorusing from tree branches over-hanging the breeding pools or hiding under small over-hangs at the pond’s edge.. I can simply position the flash around any branches or up under the over-hang that may be in the way to get the flash where I need it to be for the image, with my home-made bracket and many other commercially available brackets this is not possible, and if your bracket should by chance bump the branch that the frog is sitting on you have just lost your shot. In the above image you will see the Wimberley Macro Flash Bracket – Single-Arm Set-up as I use it with the M-8 Perpendicular Plate attached. The M-8 Perpendicular Plate will allow you to position the flash bracket a little further out and make the bracket more user friendly than it already is and it will allow you to add a second Single-Arm Set-up for a dual macro flash system if you prefer to use two flashes for your macro work. 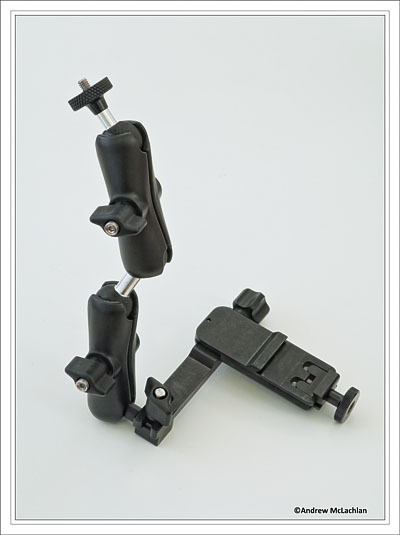 Check out the pdf instructions for the Macro Flash Bracket here. If you are looking for a high quality macro flash bracket that is solid, offers superior functionality, user friendly, and folds easily for storage and carrying in the field I highly recommend that you take a close look at the Wimberley Macro Flash Bracket – Single-Arm Set-up…I think you will be glad that you did. 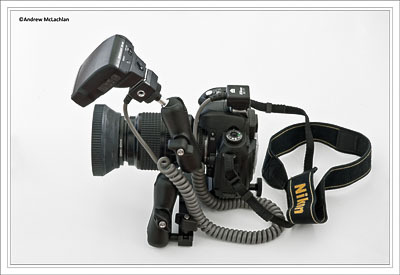 In the image below you will see how I use the system when it is attached to the camera. I have used an old Nikon D70 for illustration purposes. Do note that I will often change the position of the flash as each situation may require something a little different. The flash that I most often use is the Nikon SB400, although I will sometimes use a much heavier Nikon SB600. Even with the larger heavier flash attached this bracket is rock solid. And the next image is the home-made bracket that I used for a number of years, but will most likely never use again. 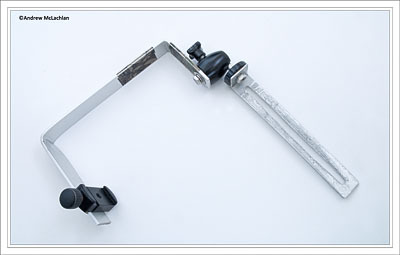 The Wimberley Macro Flash Bracket – Single-Arm Set-up will now be my go to bracket for all of my macro flash photo needs. It is quite simply the best bracket to use for my macro photography needs. 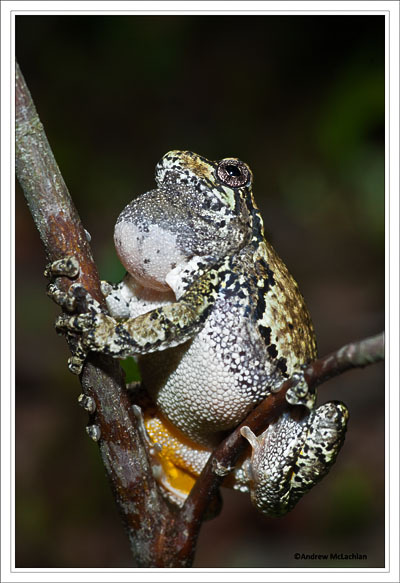 Below you will see a few recent Gray Treefrog images that I photographed during the Canada’s Victoria Day weekend while I was up in the Parry Sound region of Ontario. 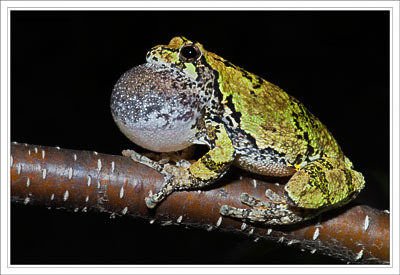 The Wimberley Macro Flash Bracket – Single-Arm Set-up made shooting these images very easy, as I was able to position the flash around some small branches to illuminate the frog as it inflated it’s vocal sac while chorusing above the pond, and for the last image I was able to get the flash to light up the area under a small over-hang where this male was calling. Haha! 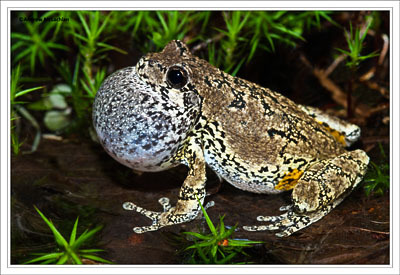 I love the photos of the frog! You definitely take amazing pictures! Thanks for stopping by Kyle, much appreciated. Great idea Andrew, thanks for sharing! I will have to take a closer look at it. Does one require any other attachment to put the flash gun on the bracket? Thanks for stopping by Bret…I use an off-camera cord for the flash and the hot-shoe connector on the cord and the 1/4 inch female thread of that simply screws onto the 1/4 inch male thread on the macro bracket. Hi Andrew, very informative post. I was looking for a good way to use my SB700 with my D7000 and 105mm macro lens. This seems like it would do the job. One question, is the M8 plate required? I’m going to get the P5 plate as well and I asked Wimberley if I neede an M8 too and they said yes, because often the lens/camera will interfere with movement of the arm w/o the perpendicular M8 plate. Any suggestions? Yes you will need the M-8 Perpendicular Plate. It makes the macro bracket more user friendly.